Suicidal thoughts more likely for kids victimized over sexual orientation, research finds. 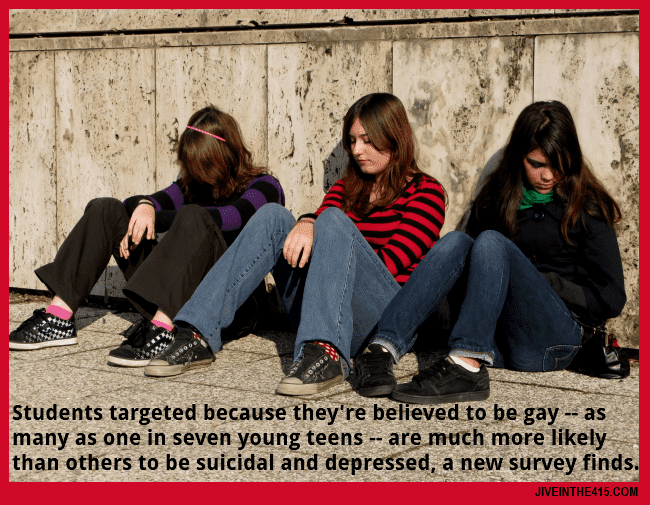 THURSDAY, May 16 (HealthDay News) -- Students targeted because they're believed to be gay -- as many as one in seven young teens -- are much more likely than others to be suicidal and depressed, a new survey finds. More than 10 percent of eighth-grade boys and girls reported that they're victimized because of perceived sexual orientation, according to a large survey of students in Washington state. "It has a profound impact on their quality of life and the way they think of themselves," said Donald Patrick, a professor of health services at the University of Washington in Seattle. "Those in eighth grade are in a particularly vulnerable position." These children "feel alone in life, that they don't feel as good as other people and their self-esteem is highly affected," Patrick said. The survey results, published online May 16 in the American Journal of Public Health, don't offer insight into whether bullying contributes to depression and suicidal thoughts in its victims. It's possible that kids with existing mental illnesses may be more likely to be bullied and perceived as gay. Nor does the research establish a clear cause-and-effect relationship between bullying and suicidal thoughts. But Patrick said "it's clear that there's an association, and I wouldn't be so worried about the causation." Prior research has also suggested that gay, lesbian, bisexual and transgender children are more likely to be suicidal and hurt themselves. A string of teen suicides in 2010 -- including the death of Rutgers University freshman Tyler Clementi -- put the issue in the public eye. Syndicated columnist Dan Savage launched a campaign called "It Gets Better" to give hope to gay teens that their lives will improve. 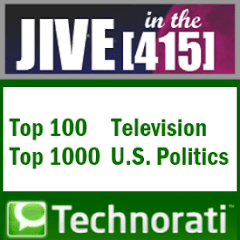 Participants have included numerous celebrities and politicians, including President Barack Obama. Based on the new findings, bully-prevention programs must address kids picked on because of their sexual orientation, the study authors said. The study is based on a 2010 survey of nearly 28,000 students in grades eight, 10 and 12. Among boys, 14 percent of eighth-graders, 11 percent of 10th-graders and 9 percent of 12th-graders reported being bullied within the previous month because they were thought to be gay. The numbers were 11 percent, 10 percent and 6 percent, respectively, for girls. 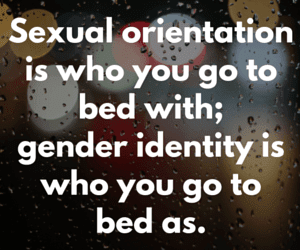 The survey defined bullying based on sexual orientation as being "bullied, harassed or intimidated at school" because they were thought to be gay or bisexual. It defined other types of bullying as when one or more students "say or do nasty or unpleasant things" to another person or tease someone "repeatedly in a way he or she finds offensive." In most cases, more students reported being bullied for other reasons. Compared to kids bullied for other reasons or not bullied at all, those targeted because they were perceived to be gay were much more likely to have considered suicide in the past year, to have been depressed in the past year and to say they don't feel good about themselves. For example, 26 percent of male 12th-graders targeted for being perceived as gay said they had been suicidal within the past year, compared to 8 percent of those not bullied. The rate also was more than three times greater for female seniors. Brian Mustanski, an associate professor in the department of medical social sciences at the Northwestern University Feinberg School of Medicine, in Chicago, said the survey has some strengths but fails to ask whether those bullied are actually gay and not just perceived to be. "Because of this, it is a major underestimate of the rate of bullying among gay youth," he said. Mustanski agreed with Patrick that teachers and school leaders need to promote comfortable and safe environments. "While family and peer support have important positive effects for gay youth and reduce feelings of suicide and depression, you cannot 'support away' these toxic effects of bullying," he said. "Schools and communities need to put in place policies and practices that make schools and neighborhoods safe for all kids," he said. The Trevor Project offers a confidential suicide hotline for gay teens and those questioning their sexuality.